Evolution Health MSM powder or organic sulfur (Methyl-sulfonyl-methane) is 99.9% pure with .1% moisture, basically 100% pure MSM since it contains no fillers,binders,or additives. Our MSM is made in the United States from raw materials obtained in the US and North America, and is also certified as pure and free of contaminants and heavy metals. It's rigorously third-party tested to ensure purity. MSM is the form in which sulfur appears in nature in all living organisms, and in which it is biologically active. MSM (organic Sulfur) is a white, crystalline powder that is odorless. We carry OptiMSM which is premium, distilled MSM powder. Distillation is a process of purifying MSM that uses heat to separate pure MSM from impurities and by-products of manufacturing through unique boiling points. MSM's 460° F (238° C) boiling point allows pure MSM to be isolated from solution, producing the purest MSM supplement available. Note: Most of the MSM supplements sold on the market comes from China or India where the purity levels are unknown and can contain fillers or aditives. Evolution Health MSM powder is pure and free of toxins. Since we personally consume our msm supplement everyday we go out of our way to make sure that we carry the highest quality and purest form of MSM powder that will deliver the best results. MSM powder should be stored in a cool, but not cold, dry area, such as on a kitchen shelf. MSM powder can be used both internally and externally. When applied on the outside of the body it penetrates through the skin (or scalp) very rapidly and improves the health of that area where it is absorbed. MSM is also a "carrier." It carries other substances along with it as it penetrates through the skin. Thus, MSM powder is the ideal substance to combine with other nutrients which are intended to be taken directly into the body through the skin. MSM is often referred to as a "penetrant." It makes the walls of individual cells more "permeable." This means that the cells can more easily get rid of garbage that is constantly being created inside the cell, and the cell can also absorb nutrients more easily. Methyl-sulfonyl-methane(MSM) (organic sulfur) is not a chemical, drug, stimulant, synthetic food additive, or any other non-organic substance. 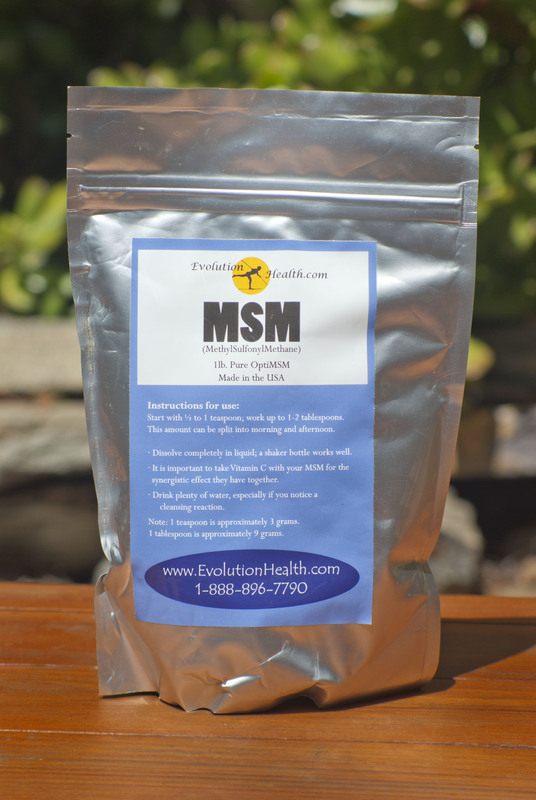 Our MSM powder is our number one selling supplement. It's a great supplement to help with arthritis, joint pain, skin issues, support for hair and nails, and over all body maintenance. MSM is an organic form of sulfur. Most people are defiecient in sulfur, but taking Evolution Health MSM powder will address your daily needs. Are you deficient in Sulfur? Symptoms of sulfur defiencieny: fatigue, depression, degenerative disease, joint pain, weak nails, brittle hair. Please note: the information contained herein has been compiled from various sources. The above statements have not been evaluated by the U.S. Food and Drug Administration. We make no claims, either expressed or implied, that any products mentioned in this article will cure disease, replace prescription medication, or supersede sound medical advice. Note: 1 teaspoon of msm powder is approximately 3 grams; 1 tablespoon is approximately 9 grams. MSM has an indefinite shelf life since it is pure and contains no fillers or binders. Fats stored in pills, capsules or bottles. Some may lose potency over time, but most multi-vitamins will last years after the expiration date. Minerals will almost last forever if stored properly. But fats and liquid supplements are different because they can be oxidized and affected by light. The pill or capsule forms of multi-vitamins that contain no fats or sensitive substances have a very long shelf life so the expiration date on these is of little importance. Why is MSM powder better than MSM tablets or capsules? MSM powder (organic Sulfur) will be more bioavailable to your body. In addition, MSM powder is far more economical than tablets or capsules. MSM powder has higher purity levels, many companies add binders or fillers to the tablets and capsules. MSM powder can mix easily with most any liquid, it does have a strong taste though. Most people find that mixing it in apple juice or tomato helps mask the strong taste. We prefer to mix msm in room temperature water and let it sit for a few minutes, the taste seems to dissipate when you do this. Put MSM powder in your bathwater and it will leave your skin getting smoother and smoother -- and even help eliminate minor rashes, infections and skin conditions. Use about 2 full cups of MSM Powder in a full bathtub for a long soaking (20 minutes) bath -- and don't worry about getting it in your eyes. Mix a 1/2 cup with a cup of epsom salt and a few drops of tree tree oil. This will help fight foot odor and fungal infections. Put MSM powder in your favorite cream or shampoo. We personally, mix it with Jojoba Oil. Jojoba oil is the best carrier oil and has no chemical or synthetics. Just pure bliss for your skin. Mix some MSM with water and use as eye drops. You can also give some MSM to your cat or dog. Just sprinkle some on their food. They will thank-you for it. Cats - 250 mg. or 1/10th Tsp. Dogs up to 30 lbs. - 500 mg. or 1/5 tsp. Dogs 31 to 60 lbs. - 1000 mg. or 2/5 tsp. Dogs 61 to 90 lbs. - 1500 mg. or 3/5 tsp. Dogs 91 to 120 lbs. - 2000 mg. or 4/5 tsp. Dogs 121 to 150 lbs. - 2500 mg. or 1 tsp. I've used other MSM supplements, but the one from EvolutionHealth, is the best one I've had so far. Definitely works best when taking in powder form, I'm able to notice the difference right away. I trust this company's products and know that I'm getting something that is pure. Doesn't taste great, but it works! I wish I had discovered MSM sooner. I got use to the taste after a few days, but I was told apple juice will make the msm a bit more palatable. Aside from the taste, this is the best MSM I have ever taken. I used to take them in capsule form, but never noticed anything. The powder form really does make a difference. I like that it's made in the USA too. I am so happy to have found EvolutionHealth.com. I am a fan of so many of their products, but my favorite by far is their MSM powder. I take it for arthritis pain and I feel an immediate difference! I feel like I don't feel stiff and creaky when I've been taking my MSM. Thank you for your wonderful products! Just a little testimonial about your product. It's great! the MSM combined with the Pure Radiance C is excellent. I use three table spoons of msm and one quarter teaspoons of radiance c twice a day. the results are phenomenal. I suffered from chronic fatigue, heavy legs and extreme joint stiffness on my left hip due to an accident twenty nine years ago. This i am blessed to say does not exist anymore in my life since starting the msm and c regimen. Also I used to suffer from heavy breathing after a flight of stairs due to severe sinusitis, allergies and being overweight. Needless to say i also suffered with four to five severe colds a year, either sinus attacks would lead to a cold or a cold would trigger sinus attacks and usually the allergy symptoms would increase as well. Since starting an msm regimen in March of 2007 I have not had so much as a sniffle. God bless everyone who finds this miracle.